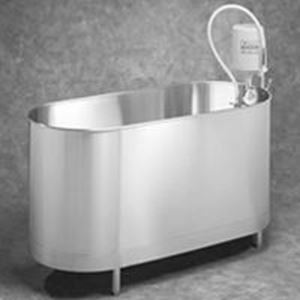 Whirlpool Trainers Large 110 Gallons - Stationary With Legs,Specifically made for use with Solaris Plus and 25 Series line! Specifically made for use with Solaris Plus and 25 Series line! Based on the needs expressed by athletic trainers, the Trainers whirlpools are specifically designed for the treatment and prevention of sports-related injuries. These units offer recuperative and healing therapy to the extremities, hips, back and shoulder areas, plus they are long enough to accommodate larger athletes. This model is for use on whole back and shoulders.